The end result looks familiar, Sebastian Vettel taking the chequered flag ahead of his teammate and a strong Lotus, but the journey was very different. 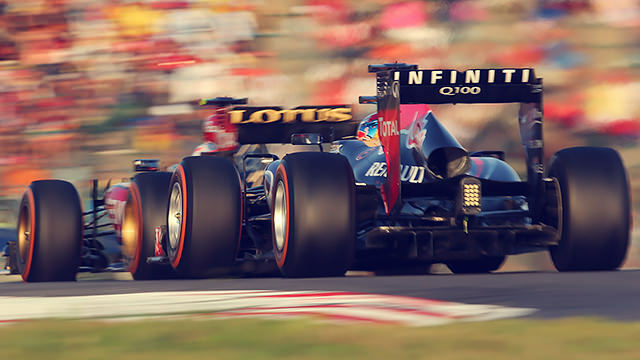 Both Red Bull drivers had poor starts, allowing Romain Grosjean to sweep past them and into the lead. He lost out in the pit lane, and then had to fend off Webber on fresher tyres for the final stint. He soaked up the pressure well but ended up losing the place, settling for third on the podium. Meanwhile, Jules Bianchi and Giedo van der Garde crashed out on the first corner. Lewis Hamilton also retired after a small touch with Vettel’s front wing gave him a puncture which in turn did plenty of damage. The Sauber drivers did well, with Nico Hülkenberg moving up one place on the grid, and Esteban Gutiérrez hauling himself into the top ten for his first points of the season, and his F1 career. Fernando Alonso finished fourth, keeping the championship alive for another race, although with Vettel’s now ninety-point lead in the standings, India could see a four-times world champion crowned.